Bereans fall short in rally from early deficit. 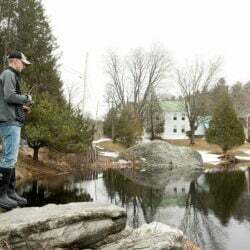 BUCKFIELD — The best season in Temple Academy history came to an end Tuesday. No. 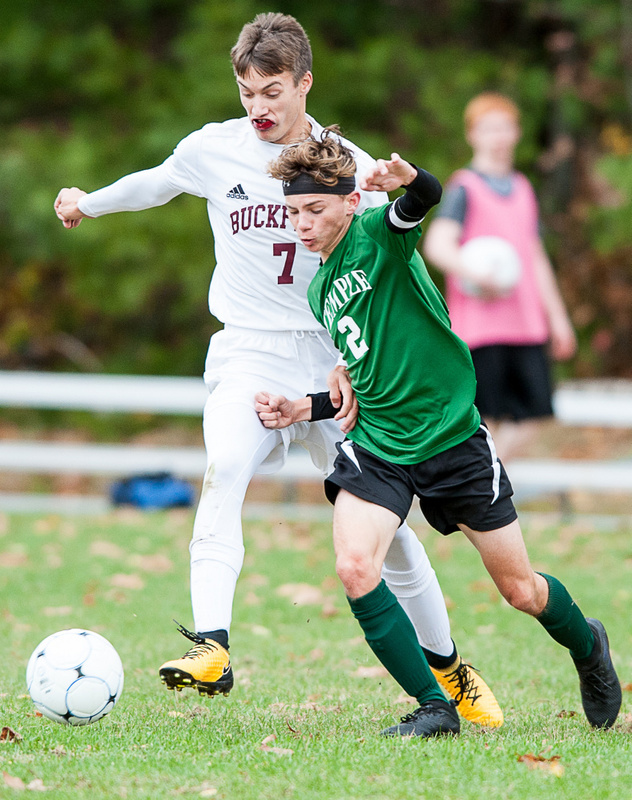 2 Buckfield raced out to an early lead and then held the third-seeded Bereans at bay in the second half, en route a 3-2 win over Temple in the Class D South boys soccer semifinals. Sun Journal photo by Russ Dillingham Temple's Nathan Riportella (6) and Buckfield's Kaleb Harvey battle for the ball during Tuesday afternoon's Class D South semifinal game in Buckfield. Sun Journal photo by Russ Dillingham Buckfield's Ethan Jackson (7) and Temple's Micah Riportella vye for a 50/50 ball during the first half of Tuesday's Class D South semifinal game in Buckfield. Sun Journal photo by Russ Dillingham Buckfield's Noah Wiley (11) tries to get control of the ball as Temple's Julianna Hubbard pressures him during the first half of Tuesday's Class D South semifinal game in Buckfield. 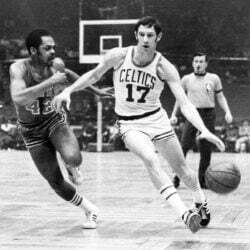 The Bucks (15-1-0) will play No. 1 Richmond in a regional final Thursday. 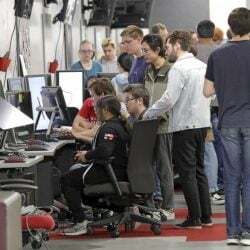 For Temple, the loss was the first of the season after having never advanced beyond the regional quarterfinals prior to this year. 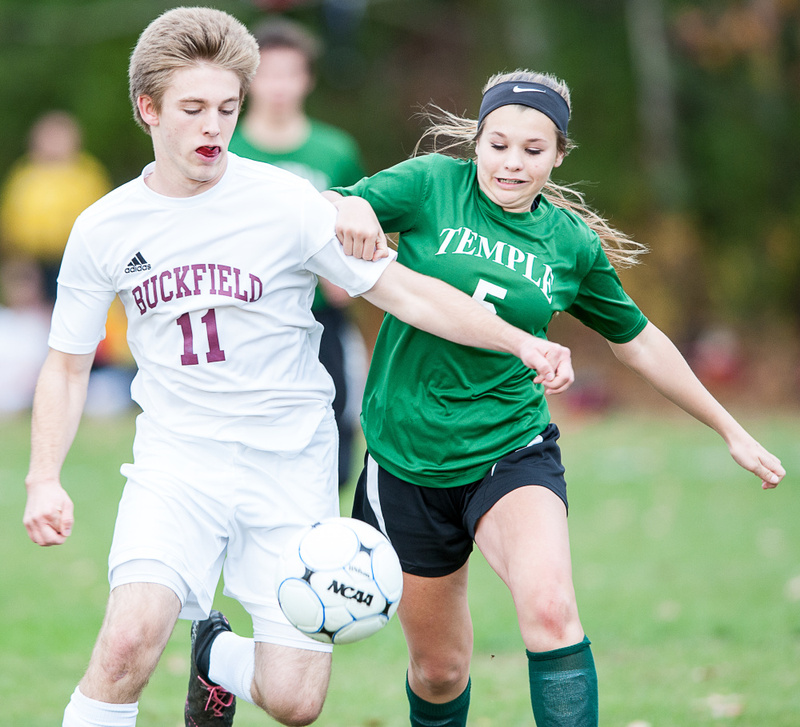 Buckfield scored three times in the first eight minutes on Tuesday before Temple (15-1-0) gave chase late in the first half. Micah Riportella and Will Paradis both scored with less than seven minutes remaining until halftime to pull the Bereans within a goal. 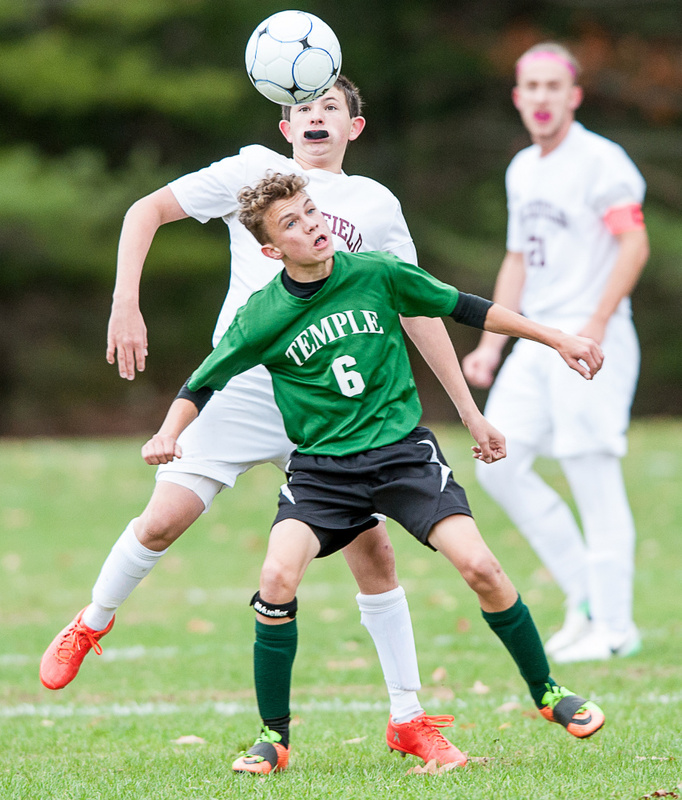 Sawyer Deroche provided Temple’s best chance to force overtime, hitting the crossbar late, after Buckfield packed the box with five backs in the second half.